Very sharp and bold! The tan background fabric is especially attractive. Very well made by a local Amish woman. 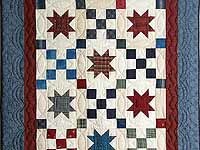 Note the fine patchwork piecing and the quilting. The border is a dark Navy print. 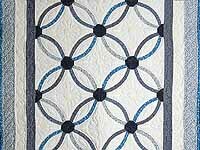 Look at the lovely fabrics selected for this charming quilted wall hanging! 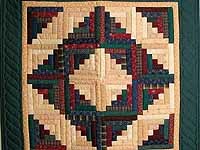 Nicely pieced and quilted by its Lancaster Amish maker. Includes a sleeve for a hanging rod. 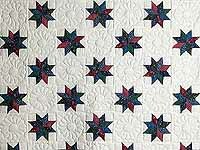 Elegant design with repeating stars, striking fabrics, and superb border treatment. Will make a cozy throw or glorious wall hanging! Made in Lancaster by an Amish woman -- note the care taken with the piecing and the fine quilting. Includes a sleeve for a hanging rod. Outstanding design that is new to us! 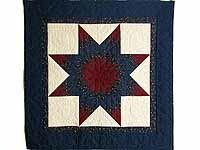 We guess the star design is named after Kalona, Iowa (the small Mennonite town known as the Quilt Capital of Iowa). Be sure to note the superb fabrics and the care taken with the patchwork piecing. Made in Lancaster by an Amish woman. Includes a sleeve for a hanging rod. 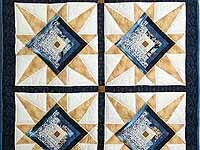 Lovely crib size quilt with combination of stars and nine patch blocks. Great fabric selections. Made in Lancaster by an Amish woman. Includes a sleeve for a hanging rod. 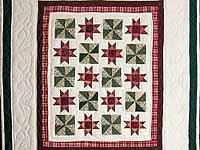 Charming combination of pinwheels and Ohio stars make this quilt a delight! Made here in Lancaster by an Amish woman. Includes a sleeve for a hanging rod. This unusual cool quilt is also called Jobs Tears. Note the beautiful blue fabrics and the care taken in the patchwork piecing. Lots of fine quilting. A lovely quilt made by a Lancaster Amish woman. Includes a sleeve for a hanging rod. Classic and classy! 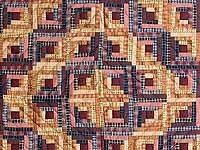 A great example of C Jean Horst's design ability -- taking a traditional design and making it perfect by selecting just the right fabrics. Note also the how well it was pieced and quilted. Signed and dated. Another beautiful creation by C Jean Horst -- note how well the fabrics were selected to fit into the miniature Log Cabin pattern. Extremely narrow logs are 1/2 inch wide. 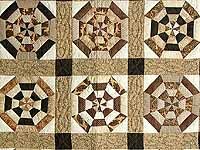 Excellent piecing and fine stitching. Reds and tans with navy plaid border. 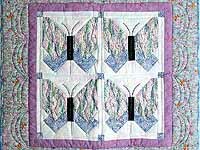 A lovely quilt to use on a table or as a wall hanging. Signed and dated.